One year ago today I lost my friend Deimos. I’m reminded almost daily of his goofy, confident, noisy Presence. I miss a herd of hounds rushing down the stairs to meet me at the door, Old Greybeard in the lead. I miss that he was so excited for walks or going anywhere in the car, that he wouldn’t stand still to hook up the lead. I miss having a buddy to say with strategic snout placement and that weird low greyhound woof, “Hey, you’ve worked enough, get off the computer!” I miss a not-so-secret 75 lbs of sneaking up onto the bed on chilly nights. Most of all I miss the individual soul that left such a gaping hole behind. Read more about my Light Box month. I’ve done everything I can. I need to know you won’t leave. I wrote a story to show love, and it turned to war. How awful. I twisted myself around stars and poked the moon where the moon couldn’t reach. I’m the kind of person who kidnaps children and takes flight. Valerian root and vitamin C tablets taken in the dark. The melting of snow in children’s palms. Hot bath taken with mint extract. Touching the moon in places the moon doesn’t know exist. Consumption of St. John’s wort. Twisting your fears into desires. Paying attention to the girl who smells of honey and smoke. I wanted to write you a story about magic. I wanted rabbits appearing from hats. I wanted balloons lifting you into the sky. It turned out to be nothing but sadness, war, heartbreak. You never saw it, but there’s a garden inside me. This week’s focus for our mindfulness practice is Contentment. Also known as Santosha in Sanskrit, it is one of the Niyamas (moral observances) in Patanjali’s Yoga Sutras. The goal is to try to find contentment in all things – good, bad and indifferent. Not necessarily an easy practice, but definitely a rewarding one. I’m so glad this intensely disappointing week is over. I worked really hard to make something good happen, only to have it promised to me yesterday, then snatched away a few hours later. I feel very defeated, even as I know that this feeling won’t last forever. It’s hard to feel grateful for what we already have, when obsessed with trying to improve our situations, our careers, our comfort levels. It’s hard to find the smallest bit of contentment, when worry and distraction are in control. Finding contentment in this disheartening thing that has happened to me. I am not a bad person. I have enjoyed June, July and August like everyone else. I fed you dandelions and picked the stems from your teeth with my tongue. You smell of honey and smoke. That’s what I call you. Girl who smells of honey and smoke. But you’re more than that. You’re a field of dandelions. I have this nightmare where I’m standing in the field of dandelions holding a scythe. The horizon is children marching. Each child holds one of your teeth. I’m so confused it almost feels calm. I am guilty of kidnapping children. I am guilty of Bianca and causing great pain to Thaddeus and Selah and the town. I want to be a good person, but I’m not. he overheard the group of former balloonists known as the Solution. How much can we put up with. How many days will this dreadful season extend itself. Our town is a place of no flight and all snow because of February. There were five of them, tall and thin, wearing long brown coats and black top hats. They had thin plastic masks over their faces. Each mask was painted as a different-colored bird. You, said one of the members, who grabbed Thaddeus’s shoulder and turned him around. Thaddeus faced the Solution, holding his basket of apples tight against his chest. We’re starting a rebellion, a war, said a yellow bird mask, against February and what it stands for. Yes, a war, a war, a war, the Solution repeated. An orange bird mask continued, We’re sick of February, who we believe is responsible not only for a season of endless gray and snow but the end of flight. A blue bird mask lurched forward and placed a square of parchment in Thaddeus’s coat pocket. He knocked one of Thaddeus’s apples out of the basket and into a pile of snow. Remember us, said the Solution. And they disbanded, walking, dreaming of flying, in separate directions. hill and into town where they stopped at the town school and the town library. They confiscated textbooks, tore out pages about birds, flying machines, Zeppelins, witches on brooms, balloons, kites, winged mythical creatures. They crumpled up paper airplanes the children had folded, and they dumped the pages into a burning pit in the woods. The priests sank their rusty spiked shovels into the mound of dirt and refilled the hole. Some of the priests felt tears roll down their cheeks but didn’t feel sadness. Others forced their minds to unravel the memory of wind. They nailed a second scroll of parchment to a second oak tree. It stated that all things possessing the ability to fly had been destroyed. Is said that no one living in the town should speak of flight ever again. I kept a kite hidden in my workshop where the priests couldn’t find it. I unfolded the kite from its dusty box and told Bianca she could fly it for a few minutes. I tried to see if the priests were in the woods but only saw owls sidestepping through the snow. I said to try again after the kite failed to take off. A hand pushed the kite to the ground. She tried a few more times, and the kite slammed downward. I saw a cloud shaped like a hand. I thought of Bianca and her happiness like bricks in mud. I said, I’m sorry this didn’t work out. We can try again. What’s the point, she said. It’s the end of flight. It’s February. The point, I said, is to keep trying for the sake of trying. On January 1st I wrote, February will be my Light Box month. It’s typically a hard month for me because it’s the month my mom died, and as of 2010, the month my old friend Connecticut died. Usually, I let it sneak up on me and end up getting physically ill. This year I’m determined to face it head on by reading, writing, and blogging about grief, illness, and mortality. Here it is, February 5, and I’ve hardly given it a passing thought. But I need to tackle it now. During the last two Februaries, I suffered from a combination of pneumonia and bronchitis that hashed my lungs, put me on inhalers, sent me for chest x-rays, drove me to the acupuncturist, and dragged on for about 6 weeks each year. Grief turned depression was the catalyst last year when my sweet cat Connecticut died of a lingering illness that reduced her to a skeleton. Needless to say, I would like to avoid major illness this year. Part of it will be luck in avoiding any bugs in public places. But a larger part will be looking ahead, accepting that it will be a hard month—and embracing the opportunities for reflection that it brings. Feb 13 (the day Connecticut died) and Feb 16 (the day my mom died) will be the toughest days and preparing for those days is a good idea. 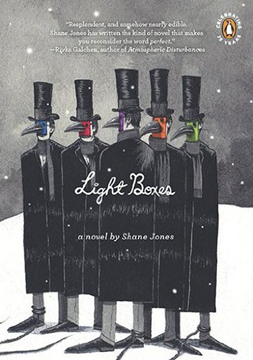 Light Boxes, by Shane Jones, is a dark little book, with a quirky and unexpected play on language and characters. It exploits tensions: heaven versus earth, dead versus alive, reality versus fantasy and dreams, flying versus being grounded. The illustrations are morosely atmospheric. It’s good to know I’m not the only one with a war against February. It’s weird what you can find online. 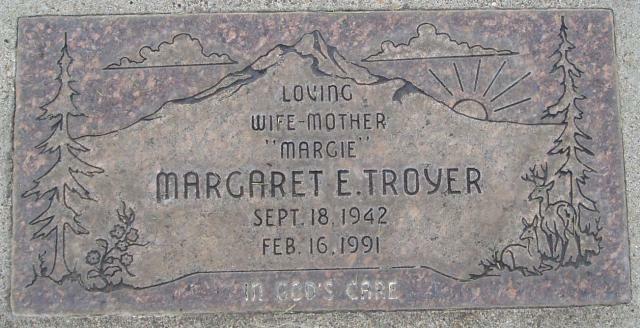 Here’s a link to a picture of my mom’s headstone that somebody took. The site allows you to create an account and add photos, basic information, etc., but advertises a paid upgrade to “sponsor” the memorial and remove advertisements. Seems a little tacky, but I’m pretty sure mom doesn’t care. And, how else would I have a picture of her gravestone handy to post here? I’ve never really been one to hang out at mom’s grave site. There’s no her, there, if you know what I mean.